Should you buy more life insurance? In a typical illustration in the middle Atlantic states of DC, MD and VA a family of four with two college bound children. The debt outlined on the chart on the left is fairly typical for a household. Add to this figure any anticipated expenses in the future, such as college tuition, weddings, funding future business or home purchases and you start to build a picture of immediate household budget needs with the loss of the primary wage earning spouse. 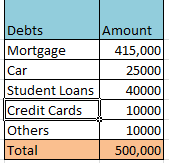 In addition to paying off debt, how will the household continue to function as before without financial hardship if one of the wage earners supporting the household becomes disabled or passes away early again before investment funds are large enough to offer a guaranteed annuity of monthly income for the rest of the surviving spouse's days? Life insurance offers the only guarantee in life to be there and ready to fund not only the death benefit, but the living benefits of the insured if they become disabled or ill and allows the survivors to accelerate the death benefit funds to pay for expenses associated with caring for the disabled person who is insured. So how much would you need to replace your income over a lifetime? If your current age is around 47, and your total household income from wages is $10,000 monthly and roughly $6,000 of that income comes from you and if you were to pass away suddenly and had accrued at least 10 years of Social Security, your surviving spouse would be eligible to receive benefits beginning at full retirement age of 67. Those benefits would be $2,277 per month in addition to his or her own social security retirement benefits (which would be around $2192 at age 67 and $2700 at age 70). If you were to become disabled now, you may be shocked to learn that your social security benefit is also only around $2200 per month leaving a significant gap of around $4000 per month in household income if you did not have voluntary short term.and/or long term disability insurance in place which could provide a monthly pay benefit of around 60% of your pay or $3600 up to age 62 depending on the type of disability insurance coverage you have selected. So let's hope for the best and plan for the highly unlikely worst case scenario (only happens to 15% of people) and assume you died unexpectedly in the next few years before age 70. This would leave an immediate $6000 per month income shortage to your household income for the next 20 years until your spouse was eligible for her social security survivor benefits when she reached full retirement age of 67. The shortage then drops to $4000 per month for the remainder of his or her life which could be another 20 years based on current mortality rates as people live to the age of around 84 and 87 for males and females respectively (almost another 20 years after reaching retirement age). So how much insurance is needed to generate $6,000 per month for the next 20 years or 240 months it comes out to $1.44 million in straight math ($6k x 240 months). When you factor that your insurer can annuitize this payment with a guaranteed rate of return of around 3%, the monthly interest alone would be close to $4000 per month for the rest of your spouse's life so that would likely be enough to cover all the planned household debts and expenses and replace the household's lost income. So how much does that much coverage cost, and can you afford it is the question I get most often? Well it depends on how you look at it. 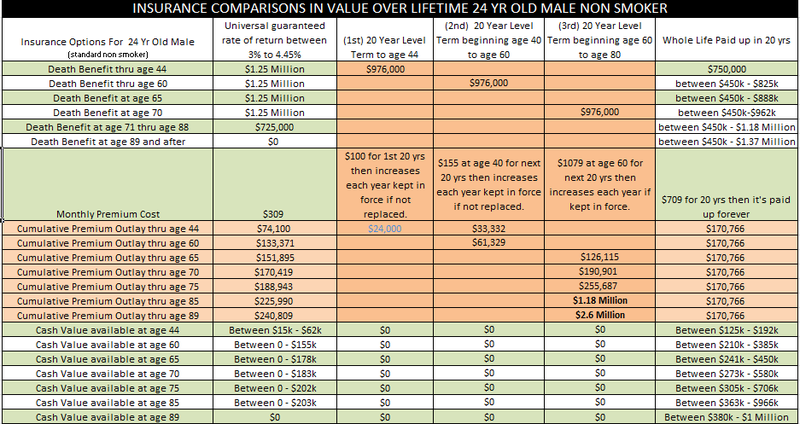 Here is an example that sums up in a table what the key differences between level term (whether it is your voluntary contribution on your employer's group plan at 4 or 5 times your annual earnings) or it is your personal private policy that you've had for years. Term insurance accumulates no cash value over time and is actually the most profitable insurance product in the insurance industry, because insurers are highly unlikely to issue a policy to anyone at risk of dying during the term it is issued. 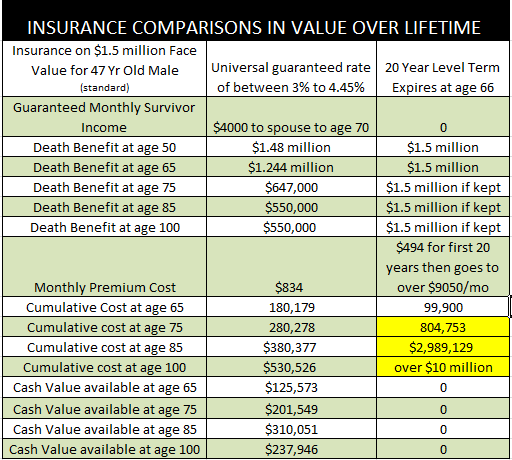 In fact, they know they will have to pay out on a whole or universal life insurance policy over time, which is why it costs more, but they also can pool the premium funds to put those funds to work in their investment portfolio and guarantee a small rate of return and sizeable death benefit to you at an affordable premium cost as illustrated in the table below. Illustration is an example only and is not a specific offer or solicitation for insurance for any individual and is not complete without specific information and all pages illustrated in the states where Raj Dwivedi is licensed and operates. Copyright 2014. Raj Dwivedi. All Rights Reserved. No duplication or redistribution is authorized. See how much the term insurance costs go up over time? Understand that most insurers will not issue term insurance policies or will restrict to 10 year terms on new policy issue past age 75 or will reduce benefits on group term issue plans as offered by Credit Unions, employers or associations because they know they will not be profitable. 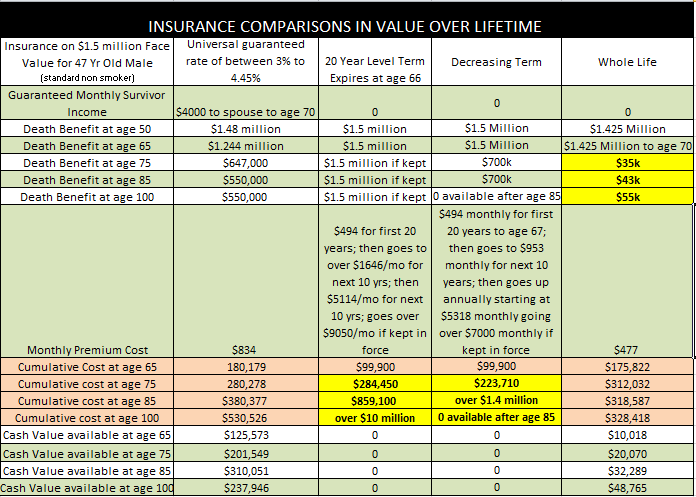 Compare all four types of life insurance policies in the chart below showing costs and values on whole life policies vs decreasing term life policies and universal life policies. Many people cannot qualify for whole life or universal life policies if they wait too long to purchase them in age or become very ill. Call our insurance professionals at 301-259-1721 or visit our site at http://dmvlifequote.com to get specific options for your case. It is free. 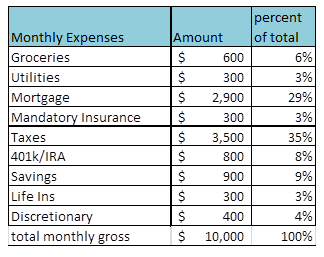 How much of your monthly income are you budgeting for your future? A school of thought about budgeting for your future is to budget enough to continue to live in the manner of your choice when you retire and are in need of skilled nursing care and remain in complete control of your life with assets available to pay for your needs and wants and leave something for your kids and grandkids to inherit after you pass away. Others believe that their social security income benefits will provide enough income for them to sustain them through retirement. Many currently (almost 42% of Americans today fund their long term care through government assistance or state funded Medicaid) or if eligible rely on VA Health benefits and believe that this will be enough for them to meet their needs in later years. A couple things to consider about the two schools of thought are without control of your future, your survivors responsible for your estate will be left to figure out how to settle debts that you incurred for your care and if you are dependent on Medicaid or VA eligibility will be cared for in the next available facility with a bed open in your state. That could mean clearly on the other side of the state, making it very difficult for your family to visit you near the end of your life. You will also not have left anything to them if your estate is sold off to settle your debts incurred for your care. Medicaid and VA eligibility will require that you spend down all assets first before becoming eligible, and anything left like real property or estate items that have value will be sold off to pay back costs of care incurred. A very simple remedy to avoid poverty in the future, is to budget for insurance like whole life, final expense, long term care and the above chart provides a pretty good rule of thumb to follow. A 47 year old male budgeting accordingly above would be secured with more than $1 million in cash valued assets, and over $500,000 in guaranteed death benefit life insurance from the age of 47 through the age of 90. Would be able to pay off his home mortgage, and would not be reliant on outside wage income past age 67 to maintain control and choices in life. Talk to a professional at 301-259-1721 or click here to tell us about how much insurance you think you need and what kinds of insurance products best suit your current needs based on your current physical risk factors and future risk factos that can effect elibility for insurance products when most needed. Insurance products for the clinically obese, overweight, or those diagnosed with diabetes, hypertension, or specific illnesses can be obtained and healthy lifestyle training can be incorporated to keep you healthy for a great long life where you get cash value back from life insurance policies.